Address: 4433, 4501, 4510 and 4519 31st St. S.
This site includes two parcels located on either side of 31st Street South. The subject site is bordered to the north by the Arlington County Trades Center; to the east by the Shirlington House Apartments; to the south by Interstate 395; and to the west by Fairlington, Abingdon Elementary School and Fort Reynolds. The applicant has requested that these applications be placed on indefinite deferral. Until further notice is provided, staff and the SPRC will cease review of these applications. The applicant, Home Properties Park Shirlington, LLC, proposes a rezoning and approval of a site plan to develop two parcels on either side of 31st Street South totaling 15.7 acres. 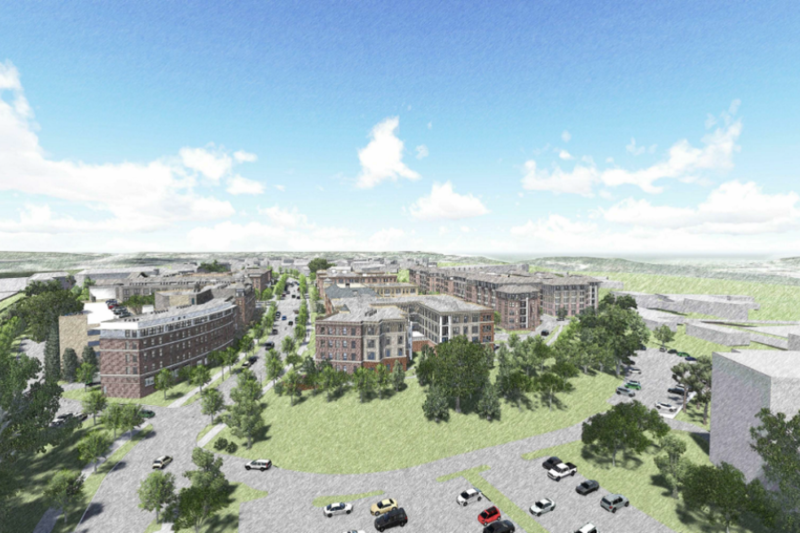 The property is currently developed with the 294-unit Park Shirlington Apartments. The applicant is requesting a modification for bonus density for green building/sustainable design under the County’s Green Building Bonus Density Program and bonus density for providing affordable housing. A total of 827 garage parking spaces and 76 surface spaces. The General Land Use Plan (GLUP) designation for the site is “Low-Medium” Residential (16-36 dwelling units per acre). The rezoning application requests to reclassify the site from the RA14-26 zoning district to the RA8-18 zoning district. The site plan redevelopment proposal (through the incorporation of bonus density provisions) exceeds the GLUP’s recommended density for the site. The appropriateness of the rezoning application and resulting density of the site plan proposal will be analyzed to determine compliance with County policies and goals. Site layout, neighborhood transitions and issues of compatibility between the proposed redevelopment and surrounding land uses will be reviewed. The site currently contains 294 market-rate affordable housing units. The site plan proposes to provide 100 committed affordable housing units. The loss of approximately 194 affordable housing units will be analyzed to determine compliance with the County’s affordable housing goals. An associated tenant-relocation plan will be reviewed to determine appropriate mitigation for assistance to tenants who may be displaced with the proposed redevelopment of the site. The site contains a portion of Fort Reynolds, a Civil War era fort, which was partially destroyed by construction of the Park Shirlington apartments in the 1950s. An archaeological study will be necessary to determine the location and character of the archaeological significance of the Fort Reynolds remains. Park Shirlington is not listed in the County’s Historic Resources Inventory but is a good example of garden-style apartment buildings from the 1950s and should be documented prior to any potential demolition activity. Impacts to 31st Street South and transit capacity will be studied to determine mitigation measures that may be necessary to support the proposed redevelopment. An analysis will determine the appropriate amount of parking that will be necessary to support the proposed redevelopment.